William Quincy Belle: America Is Number One... Not! Aaron Sorkin recently came back to television in a series called The Newsroom. I certainly enjoyed The West Wing and was grateful and surprised I got to watch the first episode of this new show for free over the Internet. (see my blog: Aaron Sorkin: The Newsroom) Personally I liked it but we'll have to see if this strikes the fancy of the public. A rant by the central character, Will McAvoy, caught my interest since this idea has been ofttimes bandied about: America is the greatest country in the world. In the show McAvoy states that America is not the greatest country in the world and rattles off a list of statistics which show America to be in anything but first place: seventh in literacy, twenty-seventh in math, twenty-second in science, forty-ninth in life expectancy, 178th in infant mortality, third in median household income, number four in labor force, and number four in exports. But he adds that America is number one in three categories: number of incarcerated citizens per capita, number of adults who believe angels are real, and defense spending, where we spend more than the next twenty-six countries combined, twenty-five of whom are allies. I'm not sure those last three first place positions are things one wants to be proud of. Okay, it's a TV show but Mr. Sorkin doesn't make stuff like that up. Is America number one? I mean objectively and not in that rah rah sis boom bah way. Considering that the up-coming election of November 6, 2012 will determine not just the next president of the United States, but which of the two diametrically opposed views of America will prevail in the White House for the next four years and determine the future of the United States. Recently none other than Republican candidate Mitt Romney himself tweeted that since Obama took over as president the United States has dropped from first place in the ranking of Global Competitiveness. (my blog: Mitt Romney tweets: America is not number one... FYI: While I find out Mr. Romney is correct in his statement, I question his implicit leveling of blame strictly on Obama without considering what happened under the tutelage of his predecessor. 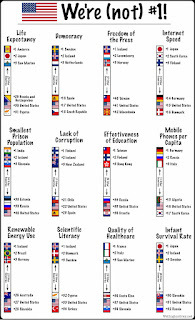 America is not the greatest country anymore - "The Newsroom"
List of countries by literacy rate, as included in the United Nations Development Programme (UNDP) Report 2011. At a time of persistent unemployment, especially among the less skilled, many wonder whether our schools are adequately preparing students for the 21st-century global economy. The U.S. proficiency rate in reading, at 31 percent, ... takes 17th place among the nations of the world... In Korea, 47 percent of the students are proficient in reading. Other countries that outrank the United States include Finland (46 percent), Singapore and New Zealand (42 percent), Japan and Canada (41 percent), Australia (38 percent), and Belgium (37 percent). The National Academies, the country’s leading advisory group on science and technology, warned in 2005 that unless the United States improved the quality of math and science education, at all levels, it would continue to lose economic ground to foreign competitors. The situation remains grim. 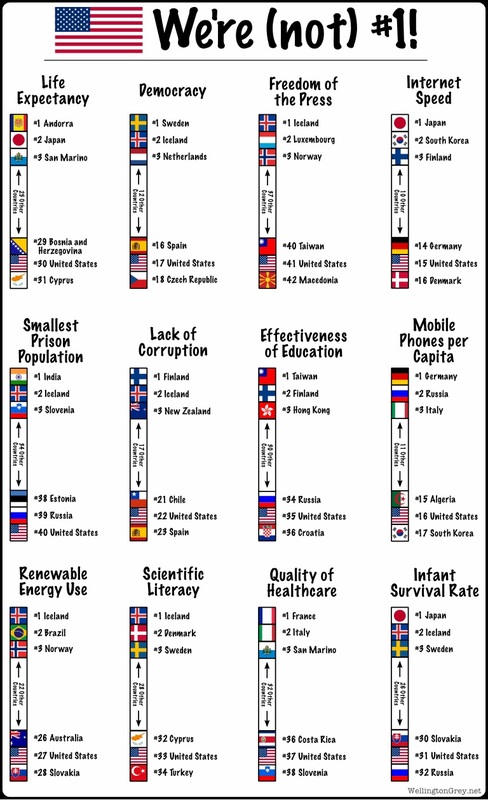 According to a follow-up report published last month, the academies found that the United States ranks 27th out of 29 wealthy countries in the proportion of college students with degrees in science or engineering, while the World Economic Forum ranked this country 48th out of 133 developed and developing nations in quality of math and science instruction. This is a list of countries by life expectancy at birth, the average number of years a person born in an given country would live if mortality at each age remains constant in the future. A new Harris Poll finds that the great majority (82%) of American adults believe in God, exactly the same number as in two earlier Harris Polls in 2005 and 2007. Large majorities also believe in miracles (76%), heaven (75%), that Jesus is God or the Son of God (73%), in angels (72%), the survival of the soul after death (71%), and in the resurrection of Jesus (70%). Am I beatin' up on Uncle Sam? Am I dissin' the States? Not in the least. While you chant "we're number one", I think it's time to wake up and smell the coffee. America is a great country and as always has potential, a great deal of potential. But you're slipping. You're not always out in front and it looks like you no longer have your eye on the ball and in some cases you've dropped it. 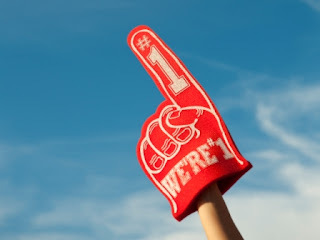 When I or somebody else points out that you aren't number one, that you may be fifth or tenth or even seventy-second, look at it not as a criticism but as a challenge. You've done better. I've seen you do better. So let's see you do better again. On November 6, 2012, all Americans will be casting their vote but they are not casting their vote just for the president of the United States, they are voting for their own future. I believe the Republicans have a flawed vision of the future. I believe the GOP has been hijacked by the more extremist elements in the party, namely the Tea Party. And I believe that many of the difficulties the country currently faces have been brought about by this flawed view of America and the world. As I have said elsewhere, the country has dug itself a deep hole and nobody, absolutely nobody is going to have an easy time of it guiding the country out of the darkness. A fickle impatient public demand quick fixes but must come to realize that if it takes decades to dig the hole, getting back out of may take a tad longer than overnight or a four year term. You've done better. Let's see you do better again. U! S! A! U! S! A! We're number one! We're number one! How many times have I seen Stephen Colbert get his audience worked up by getting them all to chant this? Sounds good. It's inspirational. Rah! Rah! Sis boom bah! But is it true? I ran across the following tweet which seems to be from the legitimate account of presidential candidate Mitt Romney @MittRomney. my blog: The 2012 Republican Platform: Are ya scared yet? Mallory, education is the silver bullet. Education is everything. We don't need little changes, we need gigantic, monumental changes. Schools should be palaces. The competition for the best teachers should be fierce. They should be making six-figure salaries. Schools should be incredibly expensive for government and absolutely free of charge to its citizens, just like national defense. That's my position. I just haven't figured out how to do it yet. "Six Meetings Before Lunch" is the 18th episode of The West Wing. A school voucher, also called an education voucher, is a certificate issued by the government, which parents can apply toward tuition at a private school (or, by extension, to reimburse home schooling expenses), rather than at the state school to which their child is assigned. ... Opponents of school vouchers say allowing families the option of both public and private schools undermines the public education system through threatening its funding and enrollment. Bill Maher rants on America letting people know we need to reclaim that title and to quit replying on old adages. This is the truest thing Lewis Black has ever said.... which is why it's so damn funny. I would add that the GOP was first hijacked by its belief that pandering to the religious right wins elections. Now they've got a big mess on their hands because the Tea Party's insistence that nobody pay taxes to support everybody's Medicare is at odds with (at least what used to be) the Christian values of the religious right. So all their energy gets poured into stuff like defining marriage and outlawing contraception and abortion which have absolutely nothing to do with government, particularly the small government they support.